I had a lonely chicken breast in the fridge just waiting to be used. I opted for a quick noodle and veggie dish for the two of us. It’s hard to not over cook and overeat so I’ve been trying to scale back some of my dishes. This was just enough for dinner, although I could have and would have eaten more if it was there! The asparagus lost its color a bit with the way I cooked it, perhaps a quick blanch first would have helped but the flavor was great. Cook noodles according to package directions. In skillet heat oil, add chicken breast. Season with salt, pepper, and cayenne and cook for 5 – 6 minutes until chicken is cooked through. Add asparagus to skillet and cook a few minutes or until asparagus is tender. 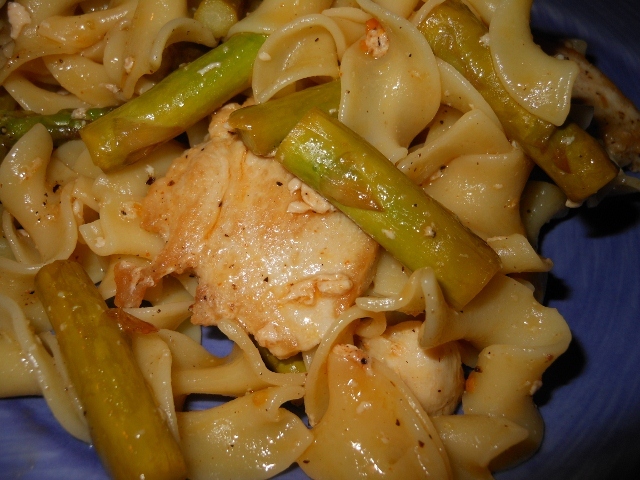 Stir in garlic, lemon and egg noodles; heat and serve. 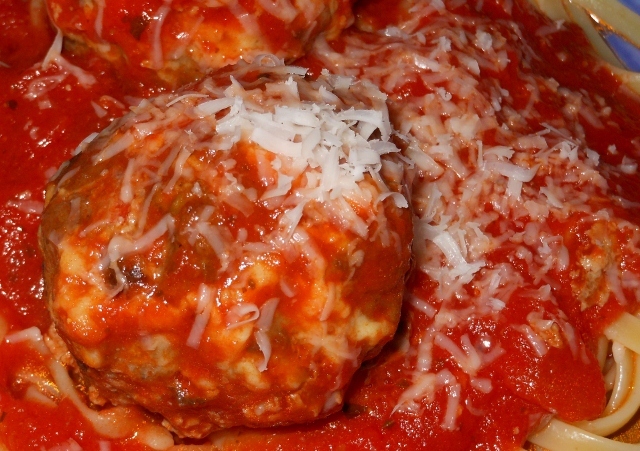 I have posted some meatball recipes before but as I was contemplating fixing today’s dinner I realized: why not put them in the crock pot with the sauce to heat everything together? It was a brilliant idea if I do say so myself. It’s always so messy heating spaghetti sauce as it can splatter about if you heat too high and a longer heat time allows the sauce to infuse with the meatballs to perfection! Combine all ingredients in large bowl. 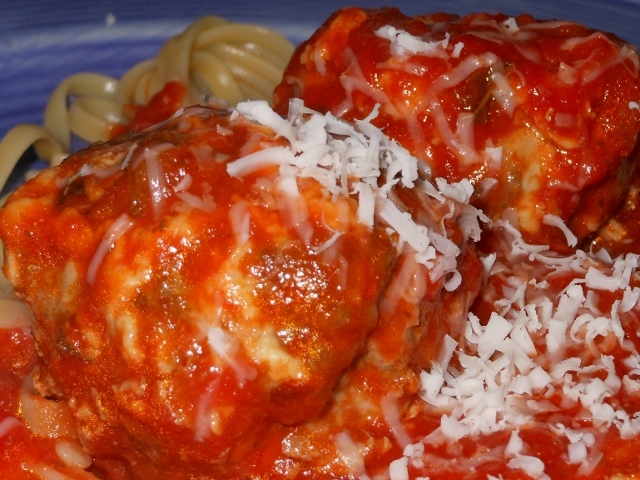 Form into meatballs; I made large meatballs today and go about 10 from the mixture. Bake at 375 degrees until cooked through; about 30 minutes for large size. Add to sauce and heat as desired; serve with cooked pasta. 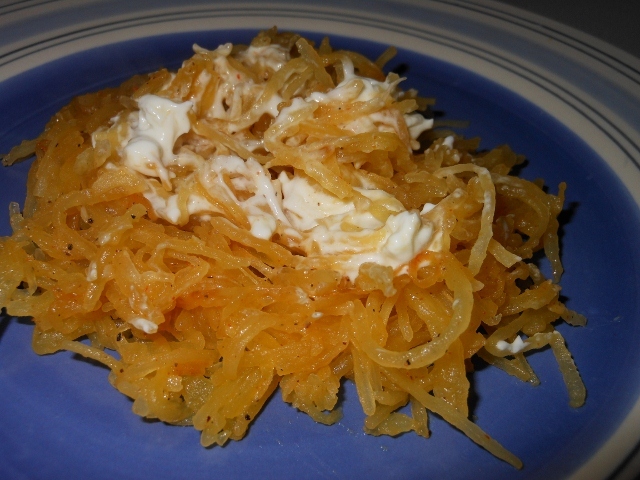 I had half of a spaghetti squash that needed used so I decided to pair it with some goat cheese. I really liked this combination. I wish I could have gotten a better photograph but something about the shade of the squash seems to distort he color and I didn’t really have the time to find some better lights today. Anyway, here is the recipe for today. In skillet melt butter; add squash, garlic, salt, pepper, and cayenne. Cook for about 4 minutes or until heated through. Squeeze lemon juice on top and stir. Serve with a little goat cheese stirred in just before serving. Ok, just a very simple post tonight. After a long day of work I’d planned to fix some fish and rice with veggies for dinner but when I got home I asked “can’t we just order pizza!” I don’t do this often; in fact we rarely eat out at all. I had Charles make us some dipping sauce for the bread sticks because the sauce is always lousy no matter who brings your pizza. If nothing else they are made out of unpronounceable ingredients so here was our tasty take on a garlic butter dipping sauce; with real butter. Zest the garlic or finely mince or chop. Combine all ingredients and melt together. Microwave for 30 seconds or melt on stove top. 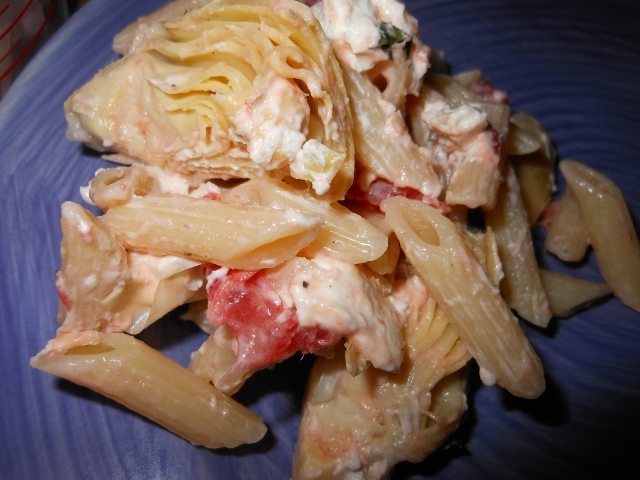 Just a quick and easy pasta salad today. I decided to go with an artichoke and goat cheese combination. I think the tomato and basil complimented the salad very nicely. Cook pasta according to package directions. Drain, rinse, and set aside to chill. 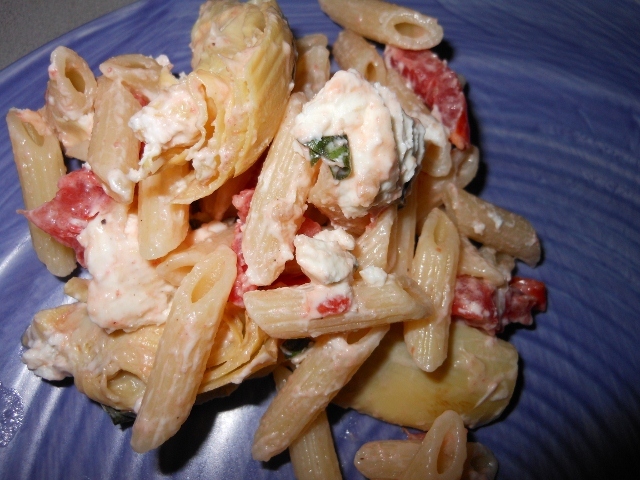 Combine drained and cooled pasta with remaining ingredients. Refrigerate until ready to serve. I was trying to decide what veggie to fix for dinner tonight and I remembered a Portobello mushroom I had picked up a couple of days ago. I asked Charles how peas and mushrooms sounded and he went into story mode. Telling me tales of his grandma fixing peas and mushrooms for special dinners. Sometimes it was pearl onions instead of mushrooms, but the mushrooms were always his favorite. 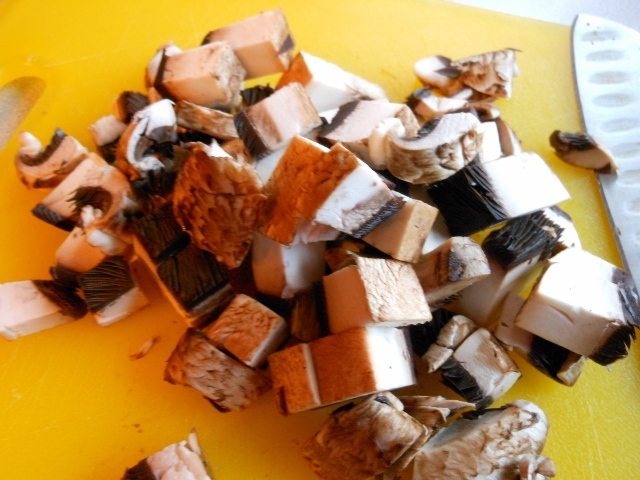 She usually used canned mushrooms as far as he could recall; canned mushrooms will work perfectly too just omit the first step of cooking the mushrooms and add everything at the same time. Melt butter in skillet and add mushrooms; season with salt and pepper. Cook for about 5 minutes or until desired tenderness. 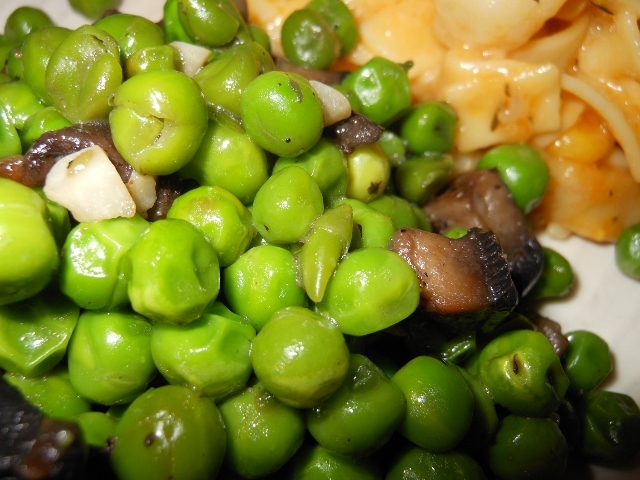 Add peas, garlic, and water. 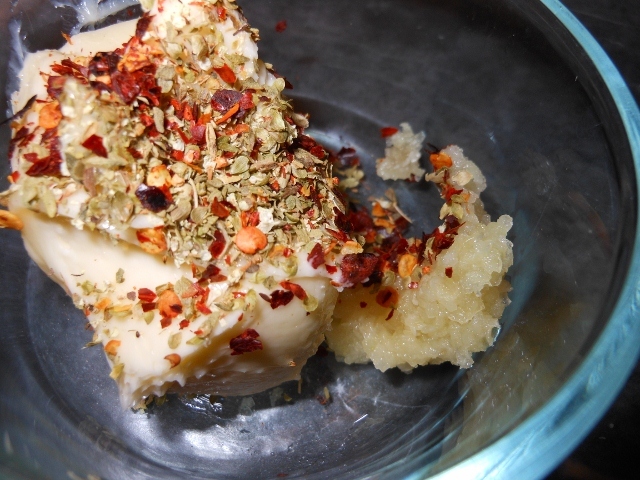 Cover and simmer for 5 – 7 minutes. We tried for a lighter lunch today. Usually my pasta dishes are very heavy so I thought I would try to lighten it up a bit. I really did enjoy this. Full of flavor and totally delicious. Bring large pot of water to boil. Add a bit of salt and angel hair pasta. Cook for 2 minutes; keep boiling and add broccoli and cook for about 3 minutes more. 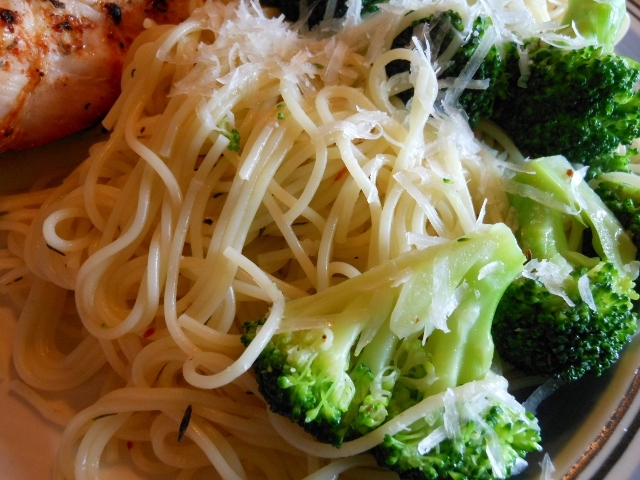 Pasta should be cooked to desired doneness and broccoli should be just tender. Reserve 1/2 cup of cooking water and drain pasta and brocoli. Set aside. Melt butter in skillet. Over medium heat add garlic, thyme, crushed red pepper, salt and pepper. 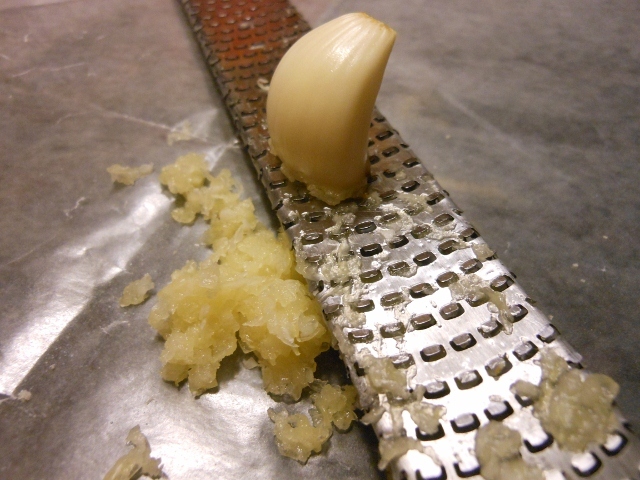 Cook for about 3 minutes allowing garlic flavors to release but not toast. 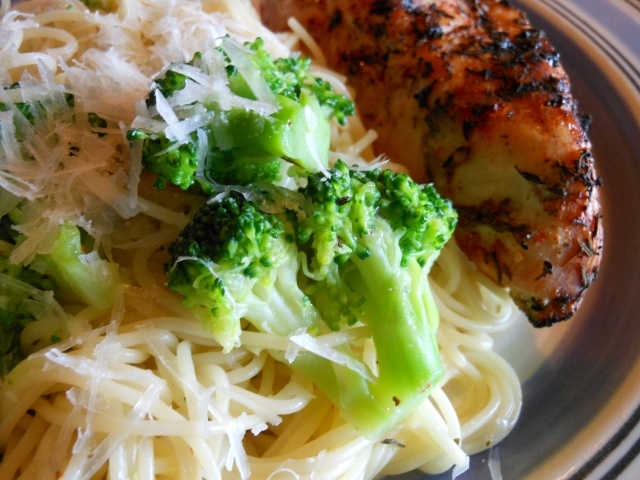 Add reserved pasta water and toss with pasta and broccoli. Stir in 1/2 of the parmesan and garnish with the rest just before serving. Charles came across a fantastic salsa verde recipe and we had to give it a try; of course we had to add our own twists. I loved this. Very spicy but our jalapeno were quite spicy so that will vary depending on the heat of the peppers. 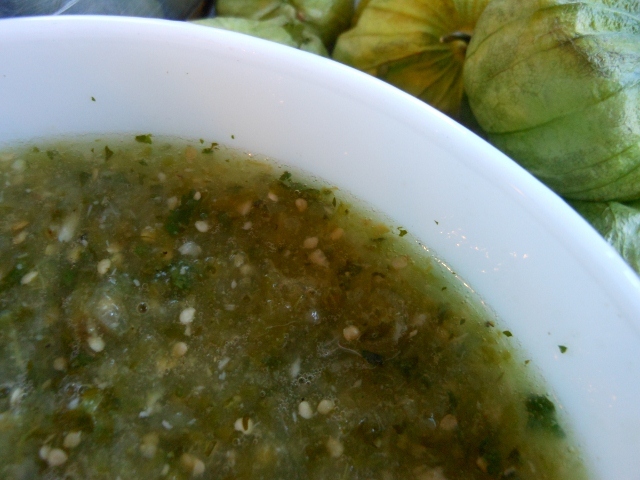 I really enjoy tomatillos ~ I don’t have them often enough; it’s sort of a citrus and tomato combination. Five minutes was just enough time to cook them without losing any of the goodness; we didn’t know if they should be cored or anything but we simply cooked them whole and pureed them for the recipe and it was perfect. Peel tomatillos and wash. 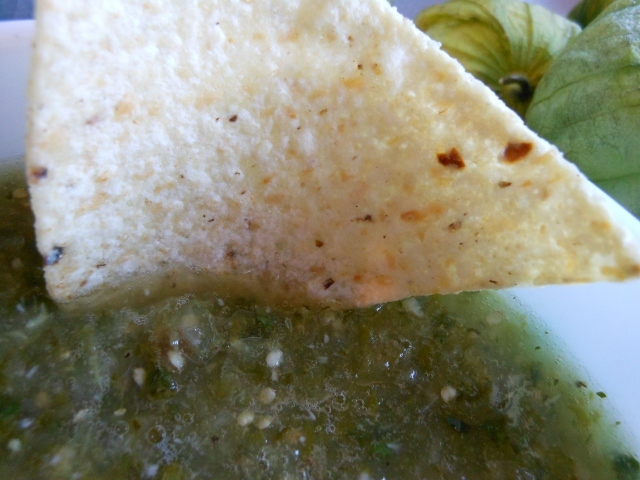 In large saucepan combine tomatillo, garlic, onion, jalapeno; cover with water. Cook 5 minutes. 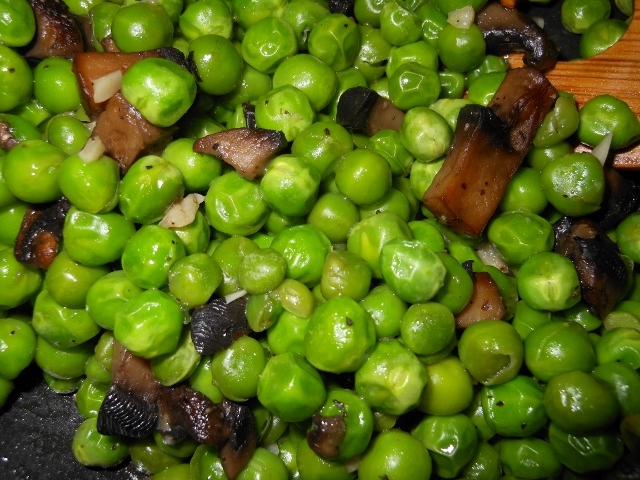 Remove vegetables to blender and add 1 cup of cooking liquid. Add sugar, cilantro, salt and pepper ~ puree for a few seconds to combine. Chill until ready to serve.